When my husband and I first moved to the bay area, I fell in love with the little orange flowers readily decorating our new backyard. They seemed so delicate but grew so profusely. I welcomed their vibrant bursts of color and their leaves that looked like floating lily pads. I was soon to notice these flowers all over our neighborhood, whether spilling over a fence or taking over a neighbor’s garden. It turns out that nasturtiums, as they’re called, are practically ubiquitous in our area; they grow like weeds, and are even considered weeds by some. But as far as I’m concerned, their commonality doesn’t take away any charm. 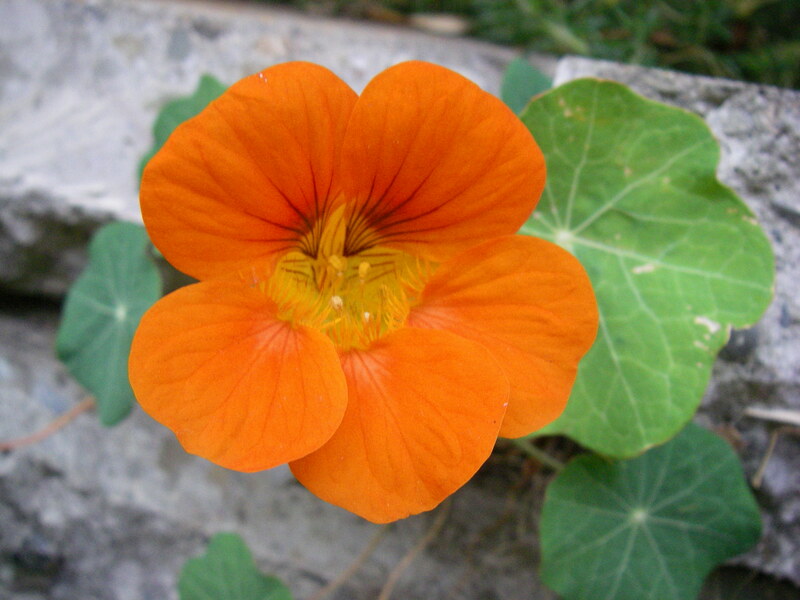 And discovering that nasturtiums are edible gave me even more adoration for them. When I’ve asked around about eating nasturtiums, I’ve been repeatedly told about their peppery flavor, and how they make a nice garnish or salad addition. While undeniable, these observations left my inner baker unsatisfied. I found myself asking, Why not highlight their spiciness with a spicy dough? Why not blend their vivid color into a complementary shade of jam? 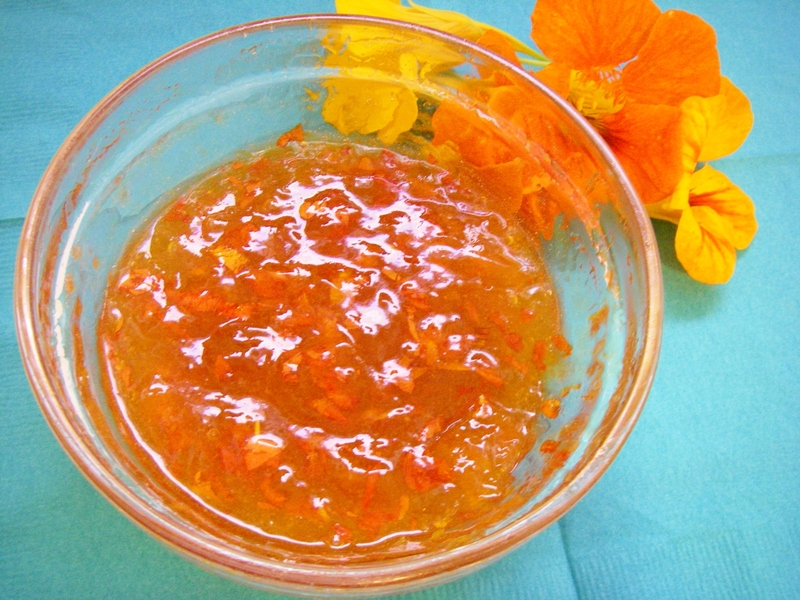 It wasn’t long before I went nasturtium-picking, and before I knew it, transformed them into a delectable sweet treat. Mix butter and granulated sugar, add salt (if using), flour, and white pepper. As described above, wash and snip remaining 5 nasturtiums; add minced flowers to dough. Use warm hands to mix the dough, which will seem dry at first, until it sticks together. While dough is still at room temperature, roll into balls (about 1 scant tablespoon of dough for each) and place on parchment-lined cookie sheet. Poke each ball with your index finger about ¾ of the way through. (Using damp hands can make this easier.) 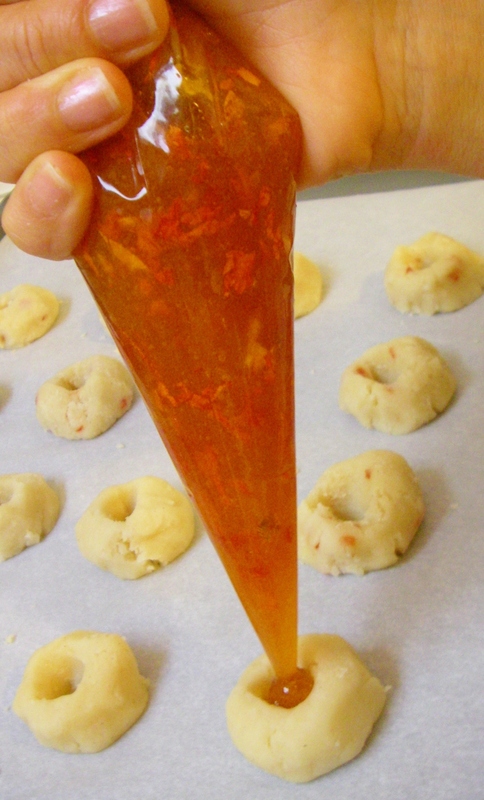 Preheat oven to 325˚ F.
Put the apricot-flower preserves in a pastry bag or plastic bag with a small piece of the corner cut off, and pipe it into the fingerprints. Chill the filled cookies for 10 minutes in the freezer or 30 minutes in the fridge. This keeps the dough from spreading too much when it’s baked. Bake the chilled cookies for 16-19 minutes, until the edges and bottoms are golden brown. Let them cool for 15-20 minutes, until room temperature. Meanwhile, make the icing (if using): Place powdered sugar in a bowl and gradually whisk in the orange juice. If it is too thick for drizzling, add just a few more drops of juice, being careful not to make it too thin. Lightly drizzle icing across the cooled cookies using a fork, pastry bag, or plastic bag with a very small hole cut in the corner. Let the icing set for at least 15 minutes. 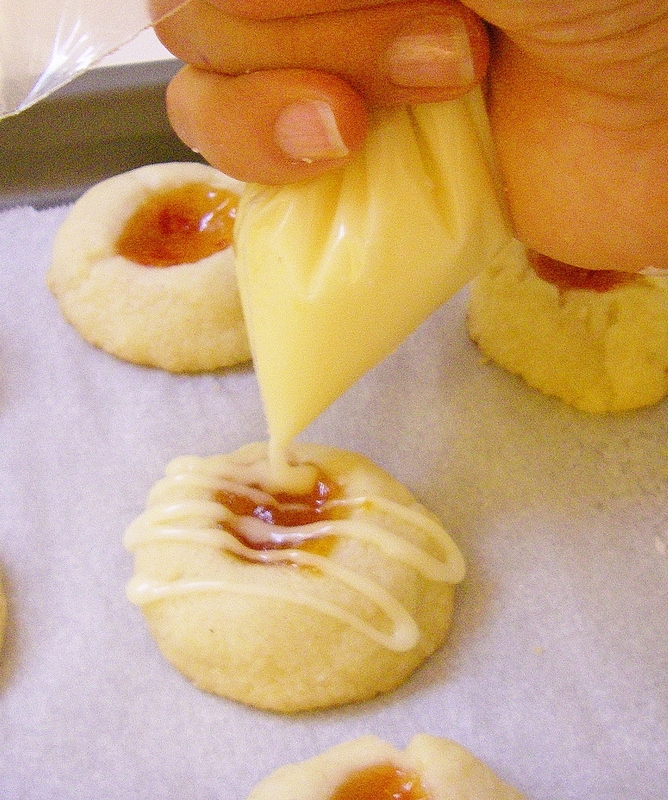 After icing has completely dried, keep the cookies in an airtight container for up to 3 days. Nasturtium fingerprint cookies are subtly spicy, sweet and buttery, and they impart a refreshing floral fruitiness. They are wonderful with a hot cup of tea or coffee, yet they hint of sunny weather – perfect for any time of year! This entry was posted in Baking with Flowers, Cookies & Bars, Sweets and tagged apricot, bay area, california, desserts, edible flowers, locavore, nasturtium, nasturtium flowers, nasturtiums, recipe, recipes, san francisco, shortbread, spicy, sweets, thumbprints, white pepper. Bookmark the permalink. Thank you, Linda! Nasturtium flowers are so delicate and beautiful. Thanks so much, Jen!� And your blog is beautiful! Yay!� I’m looking forward to it! Such a clever way to use these! I happen to have some coming through next spring and I can’t wait to try them in a sweet variety, as well as tossed into greens! Thank you! I love how these flowers are so beautiful and can be used in such a variety of delicious ways. Enjoy! Thanks so much! May your nasturtiums flourish abundantly this year! that was an interesting post! staying in a high rise apartment never gave us a chance to grow anything, needless to say use them in our foods. I wish i could grow some herbs! Thanks! I’m really not a gardener at all, so luckily these flowers just grow without any effort. Thanks! I’m glad you liked it! I wished I could bake more often. The last thing I baked were cranberry cut out sugar cookies with hand drawn icing and that was at least a yr ago! What a beautiful way to showcase your work! 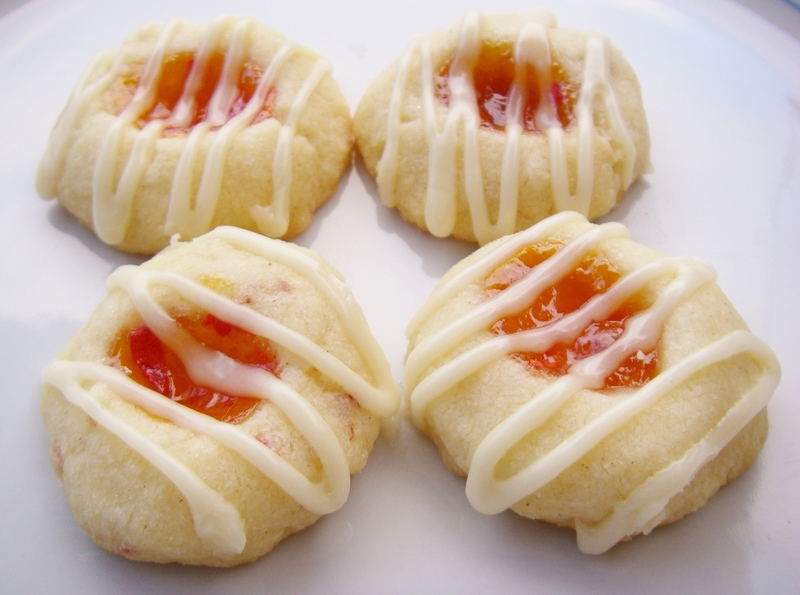 These cookies make me long for Spring. Any chance you could link to a “Recipe” page for those of us who might want to print it out and give them a try? Say, in their new kitchen for instance? Thanks, Dorothy! That’s a great idea! (I just have to figure out how to do it!) I’ve thought about uploading pdfs of the recipes on Patch; I bet WordPress makes it just as easy. I’ll look into it! I really appreciate your feedback. What a fun way to use flowers in the kitchen! I love nasturtiums too and always have them in my garden. I’ll have to try these next summer! Thanks, Emmy! I just saw your Nutella sandwich cookie recipe and will have to try those, too!